Designing the interior of a children's room for a boy is not a task for the faint of heart! You will have to try hard to find a compromise solution that satisfies both adults and children. For those who are concerned about the financial side of the issue, we immediately note that there are several simple ways to decorate a boy’s bedroom, without going beyond the budget. For example, painting walls allows you to instantly change the appearance of a room and at the same time is cost-effective. A beautiful color palette is not just a budget design. 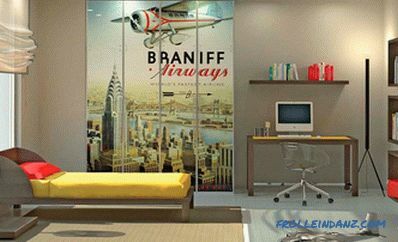 It revives the child’s room, and at the same time gives you a flexible tool that allows you to change the style and color scheme of the interior without much hassle. Although the choice of paint, obviously, is determined by the theme of the room, you can always add an element of surprise with the addition of an exotic hue. The children's rooms presented here are an example of a talented approach to work, an example of the manifestation of taste by designers engaged in their design. ..
An abundance of colors and a hint of creativity transform this small children's bedroom (from JAC Interiors ). 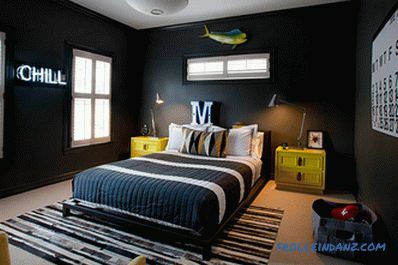 With the help of paint for school boards, a stylish black accent wall (from INVIEW Interior Design ) was created in this teen's bedroom. The red accent wall is an interesting addition to the interior of the children's room. Exquisite teen bedroom with orange blotches (from McCroskey Interiors). The white panel around the room perfectly complements the stylish walls (from Benning Design Associates ). 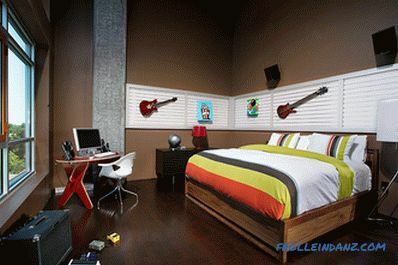 The “cool” bedroom of a modern teenager in gray and white tones. 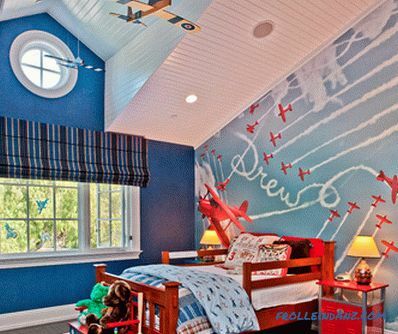 A ceiling painted with sprays of three different colors enlivens this boy's bedroom (from Laura U ). A stylish room for a teenager with dark walls (from Sally Wheat Interiors ). Using paint to decorate a children's room has many advantages, some of which are beyond the obvious. 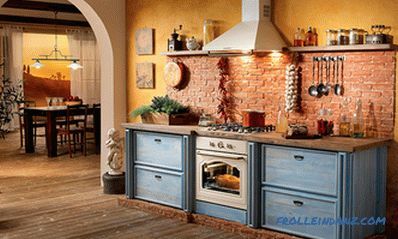 While an incredible variety of colors and shades helps to create a delightful, lively setting, the true dignity of paint comes in when you decide to change the color scheme of the interior. You can easily change the shade at any time with minimal effort, for example, using paint to indicate the color of the season. An interesting tactic is not painting the walls, but adding colorful decor to the white walls. Blue, brown, gray-green and golden brown stripes look amazing (from Jute Interior Design ). 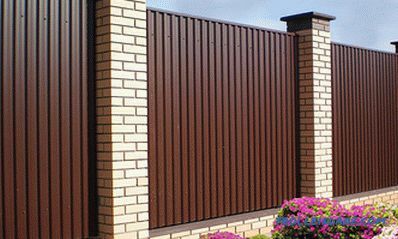 Horizontal stripes will help create a more comfortable atmosphere. Red and white stripes on the wall create a playful atmosphere. 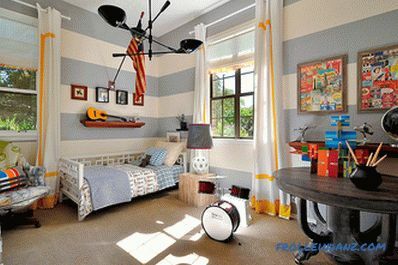 Stripes in the interior of a children's room for boys are the hottest trend of the season. A simple accent wall with a striped pattern adds subtle elegance and stylish elegance to the interior. 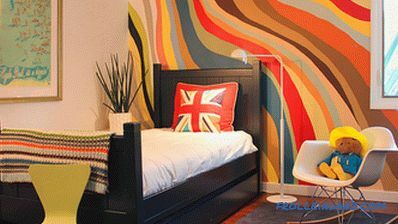 Most of these striped patterns are well-suited for bedrooms that belong to children of different age categories, and look ultra-cool even in trendy teen rooms. Use unique combinations of colors to create a room that is not similar to others (from i3 design group ). 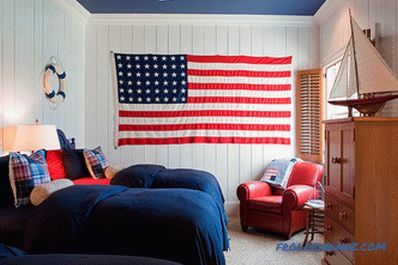 Walls that show love for the USA star-striped flag. Colors that are associated with a clean view of the sea coast (from The Shabby Nest ). 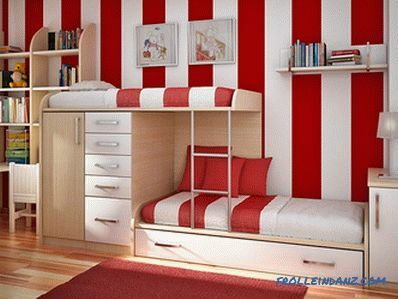 The seating area in the bedroom for boys is distinguished by the red and white stripes (from Heartwood Corp ). Green is the color of Stem green from Benjamin Moore combined with blue and white stripes (from Mary Prince ). A simple orange bar significantly alters the world! 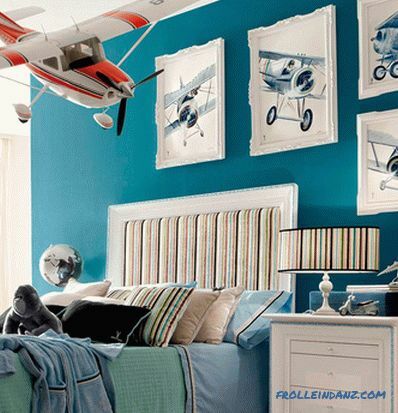 Blue is the color that just will not let you make a mistake when it comes to the design of a child’s room for a boy. All sorts of shades of blue go well with various themes. For example, you can use soft shades of blue in combination with white to create a refreshing interior associated with the sea. 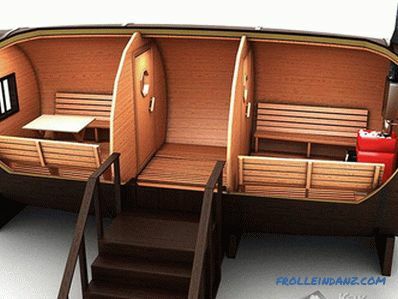 Add a few corals and maybe a surfboard, and you’ll get a boy’s bedroom with a clear, finished look. 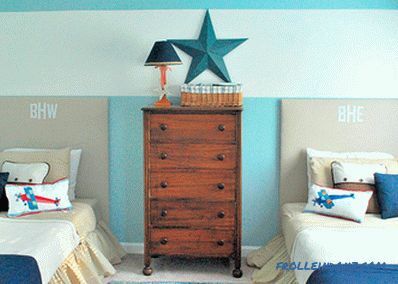 Blue and white are a popular color combination for the boys bedroom. The blue color on the walls creates a cozy atmosphere in the room. The paint allows you to turn your baby’s bedroom into a teen's stylish room (from Sarah Barnard Design ). 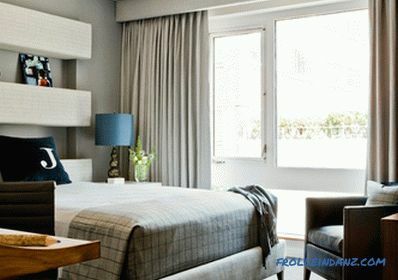 Many shades of blue give you a choice.Use this color to create a stylish teen bedroom, which can easily serve as a place of solitude for adults. Blue is often combined with white and red, but it will look great when paired with other bright colors, such as orange or yellow. 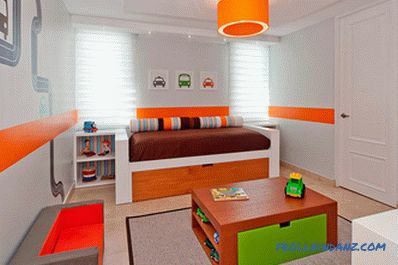 Of course, blue bedrooms for boys are quite popular today, but to create a truly unique space that reflects the personality of your child, you should look for non-standard solutions and improvise more with accessories. Simple and elegant creation of the interior color scheme. 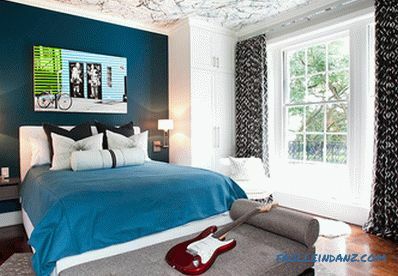 Pirate bedroom with a stunning blue ceiling (from Trade Mart Interiors ). The bedroom of the boy with an accent wall in an elegant blue color (from Imagine Living ). The accent wall adds color to the bedroom of the teenager without visual fragmentation of space (from Increation ). Relaxed, but at the same time very stylish teen bedroom. The painted ceiling emphasizes the red-white-blue color scheme of the room (from William T Baker ). Give wings to the dreams of your child! 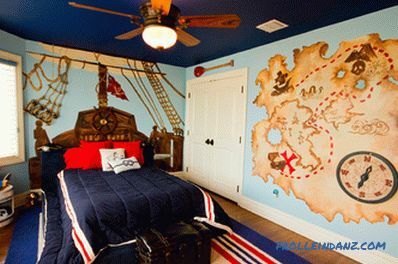 Use paint to add elaborate extra touches to the children's bedroom. It is these little things that make the room special and one of a kind. Creative painting of walls and original wall panels are a great way to create a design theme, to emphasize the style and refinement of the interior. Paint the cabinets in green and hang a large image of the scoreboard on the wall, and here you have a room for a little baseball fan. 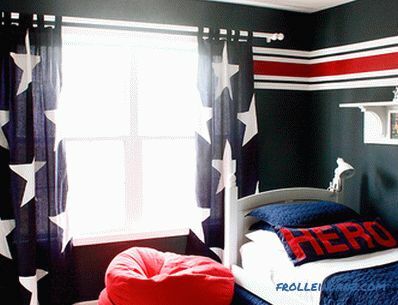 You can use the colors of his favorite football or basketball team to create an inspiring space that your son will instantly fall in love with. It's all about the inventive and creative approach! Bright colors should not be pushed back to the walls (from Guided Home Design ). Painted walls turns this bedroom into a fun space (from Sue Firestone ). 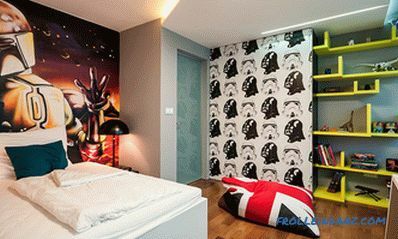 This boy’s bedroom has become so stunning thanks to the brilliant work with paint (from TRG Architects ). 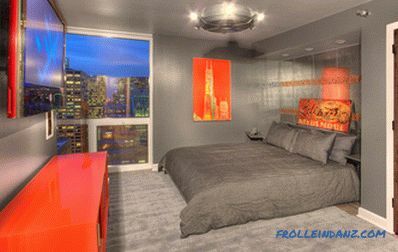 Orange-blue bedroom for a sports fan! Striped blue and white walls give this room sophistication. 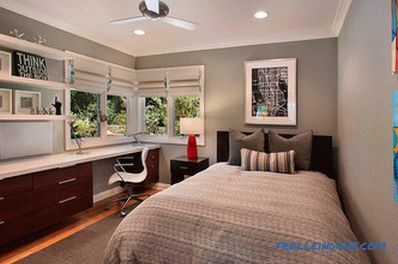 This modern boy’s bedroom has an elegant color scheme. 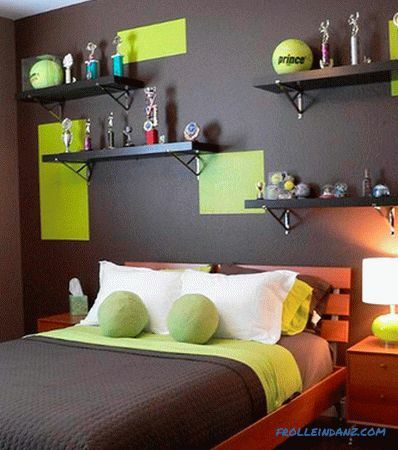 The green color of tennis balls combined with chocolate is a spectacular color palette (from Diva Interior Concepts ). 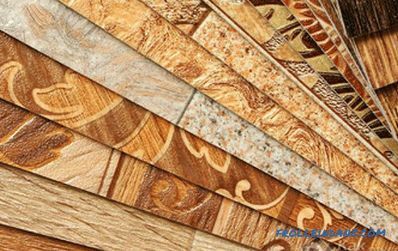 Although painting a room is primarily a matter of aesthetics, it can provide many functional advantages. So, the correct selection of color will help to make the bedroom visually much more than it actually is. 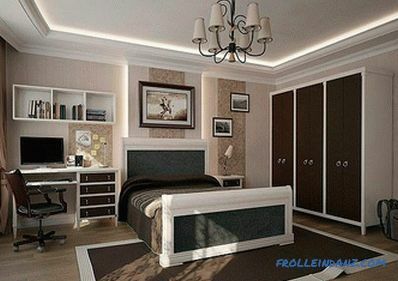 In most city apartments with compact rooms, it is recommended to use a color scheme in the child’s bedroom to reduce the visual fragmentation of space. In the rooms of little boys it is better not to use more than three colors. If you are talking about a teen's bedroom that is small in size, choose cool, neutral tones, such as gray, and combine them with accent colors. Andy Warhol-style paintings for the children's room (from Perceptions Interiors by J. Allen ). Curtains and bedding create an elegant color scheme in the boy’s bedroom. 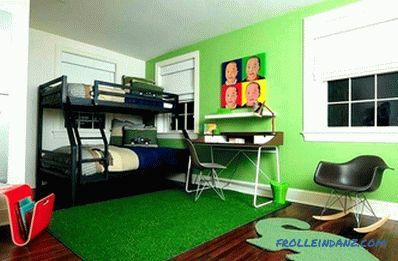 A small children's bedroom painted in the color of lime green. 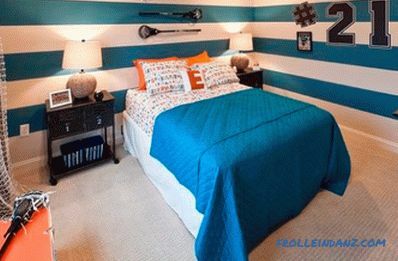 The color scheme you choose for a boy’s bedroom should be a combination of form and function. Involve children in the process of choosing the shades that will surround them in their personal refuge. 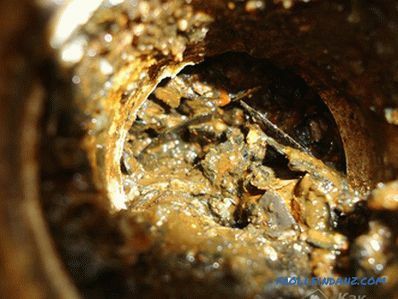 You will be surprised by their desire to do their bit! The main distinctive features of the interior of the children's room for the boy should be simplicity, conciseness and lightness. The modern room of a teenage boy in stylish muted gray tones (from Cathy Morehead ). 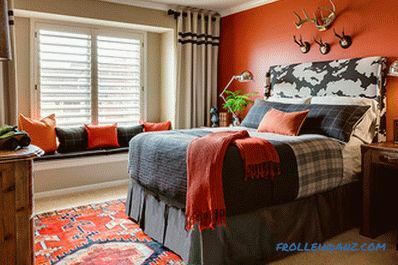 Black and red bedroom of an adolescent in an industrial style (from Cynthia Prizant - Prizant Design ). Gray is currently one of the most popular colors in interior design. The wall that serves as a chalk drawing board is a fun addition to the children's bedroom (from Cary Bernstein Architect ). The stylish bedroom of the teenager in brown and cream tones.